There is so much that can be said about Estes Park's newest and possibly best wedding venue. It rises above the local scenery to give you unbelievable panoramic views of the Continental Divide and Longs Peak. In the Fall expect to see herds of elk walking by as you enjoy your cocktail on the rooftop patio. SkyView has the best of both worlds, with a rustic look but modern amenities. The wrap-around viewing deck with covered rooftop will give you the wet/snow weather backup needed when planning a wedding in the mountains, but also the openness to make sure you can still see the view you paid to enjoy. The reception venue beneath the deck has lots of glass windows to ensure constant sight lines no matter where you sit. The venue provides the tables and chairs needed, so just choose your caterer and they will take care of the rest. The venue is exclusive for your wedding day, and the bride and groom will get a complimentary stay in their honeymoon suite the night of their event. Fall River Village can accommodate all your guests, with luxury mountain town homes and 60 riverside condos, all walking distance from downtown Estes Park. The area is yours for the taking when it comes to getting your wedding photography done, so no need to worry about going off site. 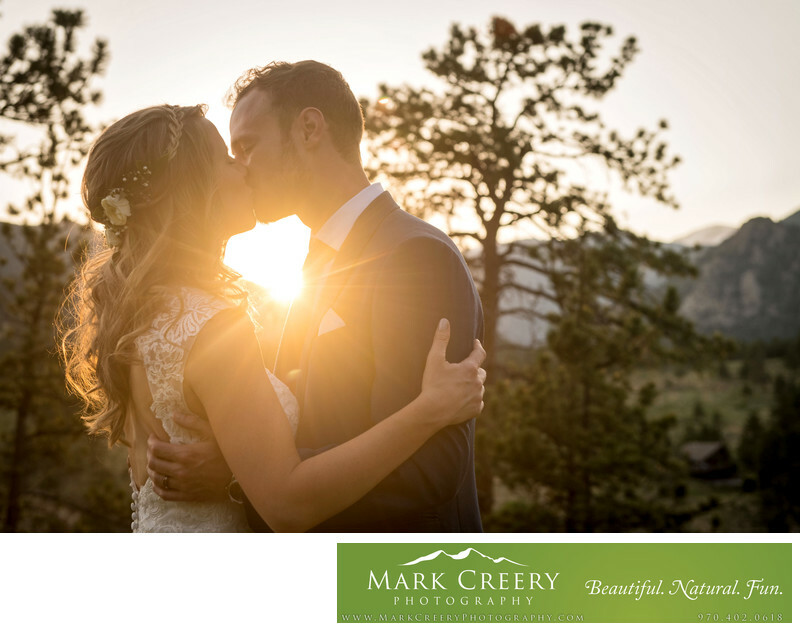 In this wedding photo taken in Estes, I captured the couple kissing just as the sun set behind the mountain, creating a romantic feel. I understand the light in the mountains, so know when and where to capture your photos to ensure you get the photos you were looking for. SkyView at Fall River Village is located in Estes Park, Colorado. Contact: 970-325-6864 and email SkyView@FallRiverVillage.com! Location: 200 Filbey Ct, Estes Park, CO 80517.